There is nothing worse than the zing that shoots through your teeth after taking a cool drink of water or biting into an ice cream cone! We’ve all been there! It can steal the joy right out of your summer iced coffee date. So what causes it and what can you do? 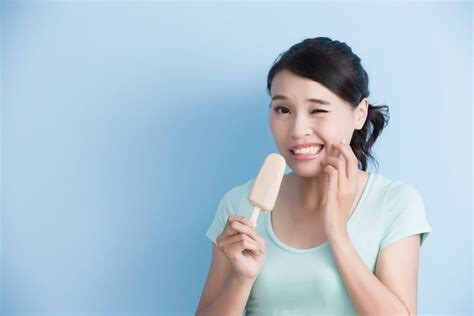 Brushing Too Aggressively: Using a firm toothbrush or overdoing it with the elbow grease while brushing can abrade away the outer layers of your teeth and even damage gum tissue. THE FIX: Always use a soft bristle toothbrush! Electric toothbrushes (Sonicare and Oral B are great) can help prevent damage caused by overbrushing. They also remove more plaque than a manual toothbrush. Clenching or Grinding Habits: The pressure from clenching or grinding your teeth can cause fracturing of tooth structure near the gum line. This breakdown is called abfraction. Abfraction leads to unprotected tooth surfaces and subsequent sensitivity. THE FIX: Decrease stress in your life (yoga anyone?)! Have your bite and jaw evaluated by your dentist to determine if orthodontic treatment is necessary. You can also try warm/moist compresses prior to bed to loosen tight jaw muscles. If you are still clenching or grinding, ask your dentist about wearing a nightguard. Acidic Foods and Drinks: Most of us love a good glass of OJ or a tangy vinaigrette, but eating and drinking acidic foods can breakdown tooth structure! This breakdown can lead to sensitivity and tooth decay (aka cavities). THE FIX: Keep acidic foods in moderation, limit the length of time you take to consume the food (don’t sip on a cup of juice over a couple of hours), and rinse with water after you enjoy the yummy treats! Using a Whitening Toothpaste: Whitening toothpastes are typically more abrasive than traditional toothpastes. The increased abrasiveness allows them to remove some surface stains, but they can wear away tooth structure over time. THE FIX: When used as directed, most products will not cause long-term damage to teeth or gums. If you notice sensitivity while using a whitening toothpaste, try rotating it with a sensitivity toothpaste or only using it for short periods of time. Having a Cavity or Gum Disease: Tooth decay (aka a cavity) is an area where bacteria and acid have broken through the outer layer (enamel) of your tooth. The bigger the cavity gets, the closer the bacteria and acid get to the nerve of the tooth. This causes sensitivity and eventually pain. Gum disease (aka gingivitis and/or periodontitis) is a persistent infection that can effect the gums, ligaments, and bone around teeth. The infection causes inflammation, which leads to discomfort. THE FIX: Make oral hygiene a top priority! Brush and floss daily. Stay away from tobacco products! Always see your registered dental hygienist and dentist at least twice a year. Tooth sensitivity is one of the most common concerns patients bring to their dental hygienists and dentists. Most sensitivity is not related to tooth decay. Many people find that using a toothpaste geared towards sensitivity (preferably one that contains fluoride and/or xylitol) relives most of the zings from their life! If you have tried all of the tricks and you are still suffering from tooth sensitivity, don’t give up the iced tea just yet! Get in to see your dentist and dental hygienist for an evaluation specific to your needs.